The course menu widget can be used to display your course units on a sidebar or widget area. Title - This is simply the title that will be displayed for the widget. Course to show - You can choose whether to display a specific course to the user or to display the course associated with the unit that the user is currently viewing. Show/Hide Modules - This option allows you to control how many modules to show before and after the current module to save space. Expand/Contract Modules - You can save sidebar space by contracting modules in the widget to just show the module title, you can also contract all but the current module, or you can expand all modules. 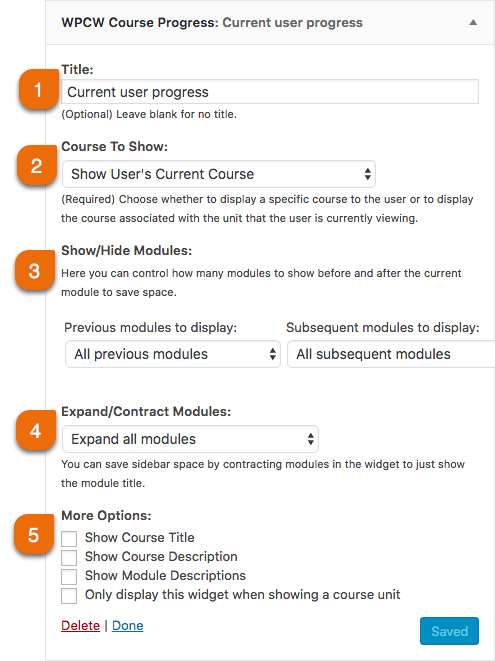 More Options - You can show or hide course title, show or hide course description, and or show or hide module descriptions. You can also make the widget only appear when on a course unit (this option is helpful so that the widget won't show up on blog posts).